Honda CR-Z practically has no direct rivals in the category 'back hatch- hybrid sports coupe' car. Now Honda CR-Z jointly develop the official tuner, Mugen, and gave birth to the car you see here, 'CR-Z Mugen RZ'. 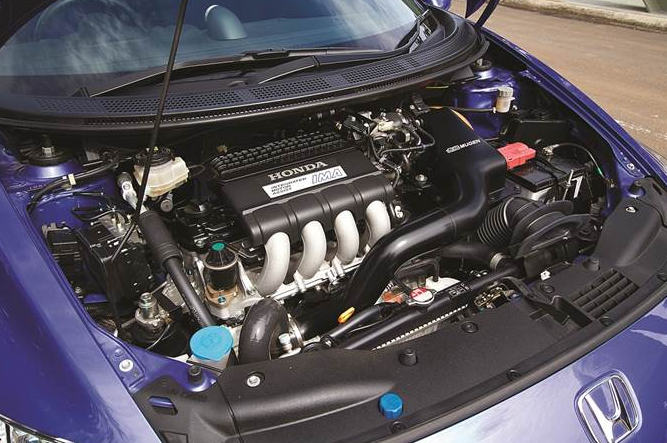 This car is equipped with a 1.5 liter engine SOHC i-VTEC engine and Integrated Motor Assist (IMA) is the same as the standard CR-Z, with the addition of a supercharger. With the addition of a supercharger. Power output of the supercharged engine is also up 36 hp to 156 hp, and followed the changes in the specific device and the ECU is programmed by Mugen. When combined with its IMA electric motor, the car has a maximum power of 176 hp at 6600 rpm engine rev and maximum torque of 185 nm at 5200 rpm engine speed. Mugen also changes slightly harder suspension and braking systems specifically. The addition of a sporty impression forwarded by Mugen on the exterior and interior appearance. 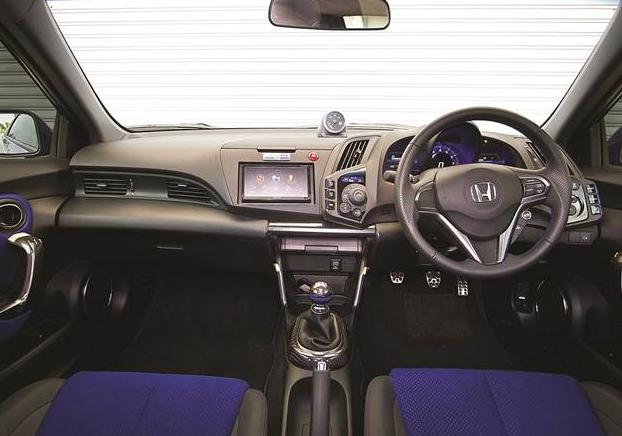 Cars that all 300 units have been sold out all over the world and there is only one unit in Indonesia was performed with Blue Metallic color azul exclusive to CR-Z Mugen RZ. This car is equipped with Mugen body kit from front to back, including a large rear wing made from carbon fiber and alloy wheels 17-inch racing. While the interior has a touch of blue color matching the car body on some parts, supercharger boost-meter, and the serial number plate '088' marker exclusivity. When the machine is turned on, the sound of the exhaust indicates that the Mugen CR-Z is intended more for show than polite as the standard version. Iis voice was very aroused adrenaline. When pressing 'Sport mode ' driving, the light in the meter-cluster changes from blue (' normal ') turn to red, and rev the engine slightly elevated. CR-Z Mugen RZ we tested here uses a 6-speed manual transmission with a displacement distance between the teeth short (SPEEDSHIFT) and the clutch is so sensitive-style racing clutch, so that we can be more 'intimate' explores this car. acceleration is quite impressive thanks to a supercharger, plus the sound produced increasingly attractive as the engine rotation increases. The presence of the 'S +' on the steering wheel to maximize the performance of the engine and electric motor, with cue indicator "Ready S +" is flashing, then the accelerator stomp down. We had time to drive a car to a speed of 190 kph on the state of the roads safe, proven additional aero-kit makes the CR-Z remained stable in the streets. acceleration 0-100 kph in the range of 10 seconds. Not too impressive, because it requires habituation to the transmission and also the weather factor. Impression of having fun together with the CR-Z actually present in the medium speed. We so adore reliability typical concoction Mugen for suspension, steering response, and weight that fits, and dunlop tires sized 205/45 R17 is capable of firmly gripping the asphalt. CR-Z turns steadily and swiftly, make each driver feel confident. Understeer effect was hardly felt when maneuvering. After playing around in the mode 'Sport', we suppress 'Econ' mode and try to explore the efficiency of its hybrid in the middle of urban areas. In addition to getting stares in awe of the other road users due to its looks, we also got the fuel consumption figures 13 kpl when passing hour traffic home office so crowded. There are auto-stop system that switches off the engine when the car is in neutral gear position, and will turn on again when the clutch and the gears 1 for the sake of fuel efficiency. Meanwhile, when the constant sliding on the highway, MID screen shows the number 25 kpl. Impressive and amazing. The drawback lies in the visibility. The rear window is split into two partitions created a line of blind-spot. In addition it also removes the additional rear wing rear windshield wiper that is present on the top of the CR-Z standard. To be sure, the car is getting a perfect score thanks to his efforts to show today's hybrid technology, captivating control, efficiency, and also look attractive. We wholeheartedly wait when all four parameters are again present in one package cars like the CR-Z Mugen RZ's.